Most of you must be familiar with a variety of email services. If you are a regular email user and you receive a lot of mails everyday, then you must have had a hard time sorting out your emails so that your inbox does not get messy. So you can sit for 2 hours and clean up your inbox, or you can go for Sanebox and let it do the job for you. 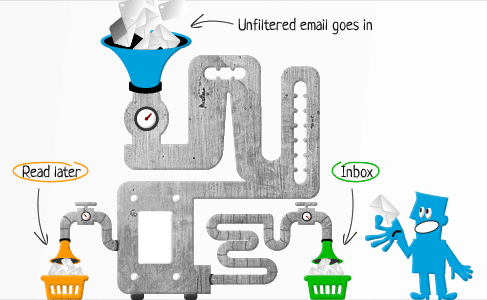 Sanebox integrates with your email service and provides you organised emails automatically using intelligent filtering algorithms that are insanely accurate. The emails are organized into separate folders and prevent them from cluttering your mailbox. You can also define emails to be put in the SaneLater folder to dely receiving email messages. Sanebox users save 2 to 3 hours every week as their mails are automatically organized. Sanebox also offers a remarkable opportunity to renew your subscriptions through invitations. For each invitation, a user gets $5 (price of one-month’s subscription) credited to his Sanebox account for every invitation. What’s more the invited person also gets $5 credited if he accepts someone’s invitation and joins Sanebox. This offer is a limited time offer so sign up as quickly as you can. The sign up process only takes a few seconds. Sanebox is a really useful tool for keeping your email account clean and organized. Sign up below and make your email inbox look “sane”. Uses smart algorithms to determine the importance of emails and keep unimportant ones in separate folders. Supports most email services (like Exchange, Gmail, Google Apps, Yahoo, AOL, Me.com, etc) and also supports email clients (like Outlook, Apple Mail, Sparrow, Thunderbird, iPhone, Android, etc). Sanebox is easy to use. Once you authorize Sanebox to use your email account, all you will need to know is how to use email folders. No new UI to learn, no downloads or plugins to install. Sanebox does everything automatically. Sanebox is intelligent enough and needs no extra training. But optionally, you can also connect your Social Networks and make it even smarter. Tired of useless newsletters? Just add an email to the SaneboxHole folder and you’ll never see emails from that particular sender again. They are automatically moved to Trash. Sanebox provides follow-up notifications in case you haven’t replied to an email within a certain time. Put an emails in SaneTomorrow, SaneNextWeek or Custom Defer folders and get those emails deliverd to your Sanebox when the right time comes. Get paid every time you invite someone to Sanebox. Every user will get a $5 credit each time a friend joins Sanebox from his invitation. The refferer as well as the refferal both get credited. Sanebox sends a powerful summary of your activity from time to time. The summary consists of the latest unimportant mails, upcoming reminders and a lot more. The Summary also contains emails that have automatically been moved to the Spam folder so that you can review any mail that might have accidentally been marked as spam. Sanebox offers up to 5 importance levels for mails. However, by default, there are only two levels – important and unimportant. Sanebox never reads your emails. They sort out emails by examining email headers they call “envelops” and determine where to put them. After that, they request the email service to put the specified emails in specified locations. Emails filtered by Sanebox are not deleted. They are just moved to special Sanebox folders. Sanebox is available as free trial for 14 days after which you require Premium Subscription to continue. Post free trial, all your folders will be reverted to their previous state (before you used Sanebox). You can extend your Sanebox usage by opting for Premium membership.